Sometimes you can watch an episode of a TV show and just feel how much fun the cast is having with everything they’re doing and saying. “The New Rogues” is one of those episodes for The Flash. Just about every scene of it felt joyful and reminded me of why I love this show in the first place. And it’s not because I have any particular love for The Flash as a character, or because I’m heavily invested in this show about time travel and people who can run really fast — it’s because it’s a show that relishes the absurdity of its material. The Flash not only accepts how ridiculous its premise is, but actively thrives off of that ridiculousness. You can tell that the actors on this show might not really get what they’re saying about molecular decelerators or Droste effects, but they absolutely adore the fact that they’re able to say these things. All I want from my superhero shows is fun, and “The New Rogues” is a whole lot of fun. As a bonus, it also delivers some terrific lines, great comedic performances, a pleasantly entertaining A-plot, and a sprinkling of romance. I really can’t ask for much more than what this episode has given, and I am so happy that the doom and gloom of last season is nowhere to be seen here. The plot for this week is simple. It’s even more simple than last week’s return to simplicity, since this week Alchemy isn’t even in on the action and only gets one passing mention to remind us that a season story arc is still going on somewhere in the background. This episode’s metahuman villain, Mirror Master, and his companion, Top (not one of Cisco’s best names, let’s be honest) actually got their powers the old-fashioned way, via that particle accelerator explosion three years ago. Ol’ MM gained the ability to slip through any and all reflective surfaces, while Top causes extreme vertigo in her opponents. Why didn’t Cisco name her Vertigo? Is that villain name already taken? Anyway, Mirror Master had been trapped in a mirror for those three years since the explosion, while Top had been captured at some point and only gets to go back to her villainy when her reflective beau returns to take over Central City. Mirror Master and Top were once part of Captain Cold’s crew, and I’m not really sure why the show brought back Captain Cold for these two previously unseen villains, in what appears to be a one-off flashback. Was it just more believable that Team Flash could imitate Captain Cold, rather than some unknown, in the exciting final showdown? I suppose it’s all good. Wentworth Miller briefly got to ham it up as the horribly named Leonard Snart, which just adds to this episode’s fun. No complaints from me. Because they had been in a fight that was interrupted by the particle accelerator explosion, as soon as Mirror Master — actual name Sam Scudder — pulls himself through his looking glass and into the present day, he’s on the rampage to find Snart and... kill him? Probably kill him. It’s always murder and revenge with these villains, I swear. Why can’t they be more like the heroes of the story and — Oh. Wait. Never mind. Three years and one whole season of a spin-off have passed, however, so Snart is nowhere to be found. But Mirror Master is nothing if not opportunistic, so he decides that the absence of Snart just means an easier time of taking over the city along with his vertigo-inducing girlfriend. As per usual, Mirror Master and Top win a couple fights against our heroes before the good guys can figure out how to defeat the bad guys, and Barry actually gets trapped in a mirror for a little while. But defeat them they do, with the help of a lot of broken mirrors (I guess Barry’s reached a point of diminishing returns on the bad luck), and after Barry is rescued from his mirror by none other than... Killer Frost! DUN DUN DUN! Or like, Caitlin with Killer Frost powers that she’s still keeping from the team for some reason. Even though the title really makes no sense as far as the theme goes, “The New Rogues” does a remarkably thorough job keeping all the little bits of plot in line with the idea of reflection — the literal, Mirror Master kind of eeeevil reflection as well as the “sit and think about your life” kind of reflection. A lot of the time, The Flash has to connect the A and B stories with a clunky line that makes the audience realize whatever’s happening in Barry’s life and whatever’s happening in the metahuman battles are thematically similar. Not the case here. The simple plot and simple character motivations cleaned out the cobwebs and made the themes fun to think about and relate to each other without feeling like the puzzle pieces were being forced together where they didn’t fit. I mean, I was mostly distracted by the hilarity and Tom Cavanagh in a Steampunk outfit, and even I was able to connect the episode’s dots without any subtle-as-a-brick lines to do it for me. Good on you, The Flash! One of the metaphorical plots associated with the reflection theme is the stuff dealing with Barry and Iris’s relationship, and Barry doing some internal reflecting on why a relationship with the woman he loves (the woman he loves in pretty much every parallel universe or alternate timeline, I might add) seems to be so difficult. The conclusion he arrives at is, of course, that it’s Barry himself causing the problem. Barry is usually the problem. Like, he’s an adorable puppy, but he’s an adorable puppy who chews on your favorite pair of shoes and also occasionally ruins the universe. This trouble-in-Westallen-paradise storyline is not at the level of awkward as it had been last week, when they were trying to have a successful first date, but Barry has some hang-ups about dating his longtime best friend and the daughter of the man he sees as a father figure and it’s seriously getting in the way of Barry/Iris make-out time. 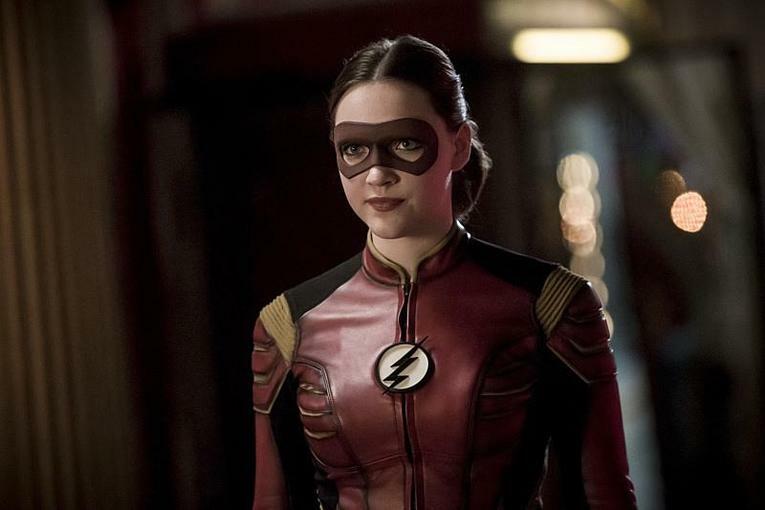 I’m not sure what the difference is between this episode and the last episode, but I found Barry’s awkwardness in “The New Rogues” to not only be more believable, but also more charming. Were the actors just having more fun with the scenes this time around? Was it because they put the focus more on an outsider of the relationship causing the awkward? Don’t know, but it led to some fantastic moments. And a third plotline adding to the idea of reflection is The Search for Wells 3.0. This is both a literal reflection (Wells is seeing bizarre reflections of himself from other worlds) as well as a metaphorical one (Wells and the team reflect on the value he adds, and what they need from a Harrison Wells). It’s also clearly just an excuse for Tom Cavanagh to try out an array of Harrison Wells alternative personalities (including an Old West cowboy type who ate a bad dinner, a faux-British Steampunk Wells, and a MIME!) and yet another example of the show having fun with this whole episode. They end up choosing a vaguely hipster Wells who goes by “H.R.,” which I can’t hear and not automatically tack “Pufnstuf” onto. Anyway, H.R. will probably turn out to be evil because good versions of Wells either die or can’t stick around for very long. Or, you know, Tom Cavanagh will just get sick of this personality eventually and really want to play a mime. Man, I hope we get a few more episodes like this in the future. I know it’s not good for the season-long plot, but between the hero of the show destroying the timeline and the heroes of every other show brooding broodily, episodes like this one are just refreshing. Sam Scudder was touching a mirror when the particle accelerator explosion happened, and he got mirror powers. He should be thankful, really. That could have been so much worse. Jesse’s sweatshirt in her first scene is so weird. Do her elbows get too warm for complete sleeves? “No touching!” No, touching! Don’t try and prevent the adorableness that is Jesse/Wally, Harry! How much fun do you think Tom Cavanagh has playing all these different Harrison Wells? I bet it’s all the fun. “Staying in is so much better than going out.” I’m having that painted onto my front door. "He's your... our... Joe. Joe, I don't know." Grant Gustin is so good at mumbling lines, to optimal comedic effect. "Oliver told me that Snart... left with some friends of ours on a... trip." I love every line from Grant Gustin this episode. "I love you—" "—I love you too—" "I love her..." For real. Every line is golden. Meanwhile, Harry is saying stuff like, “I care for you too, you jack-wagon,” to Cisco and this episode is just dialogue perfection. “Look, I can’t pretend to understand or care about the science of it all…” Joe is all of us. “You can’t trust a mime.” I can’t believe one of the Wellses was a mime. This show, you guys. This show. That West Family Group Date was equal parts awkward and hilarious. I can’t believe how cute Wally/Jesse got in such a short amount of time. This is an excellent review. This line, "Barry is usually the problem. Like, he’s an adorable puppy, but he’s an adorable puppy who chews on your favorite pair of shoes and also occasionally ruins the universe," is perfection. I particularly enjoyed the end scene with Iris and Barry at the dinner table talking about Barry feeling kicked out - this episode did a lot on selling me on their chemistry.